The Tau Ceti star system is just under 12 light years away from our solar system. It contains a single G-class star similar to our own. That similarity was such that in the late 20th century, the system was considered a likely candidate for life. 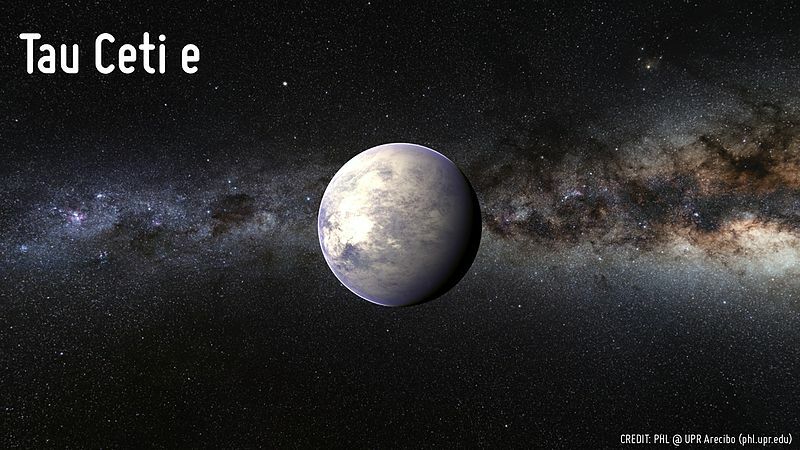 When the search for exoplanets began in earnest in the early 21st century, various discoveries about the system (in particular the larger than normal debris cloud) dispelled hopes that the system could contained advanced life. With the reception of the Tau Ceti signal in 2076, greater interest in the system intensified. 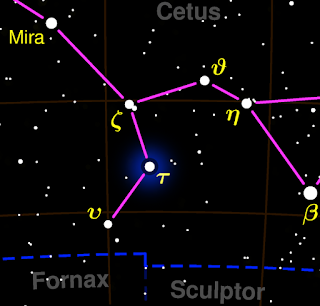 Tau Ceti is the closest single G-type (the same class as our sun) star. It is less massive at just under 80% of the Sun’s mass. It has a similar ratio for its radius at around 79% of the Sun’s radius. Analysis has indicated that it is a stable star. Its metallicity (the abundance of iron in its composition) is about a third of the Sun, indicating that it is slightly older at approximately 6 billion years old. Its rotation has been measured at 34 days. The luminosity of Tau Ceti is just over half of the Sun, meaning that any habitable planets would be much nearer to the star than Earth is to the Sun. Tau Ceti has long been thought to have a number of planets, with 5 terrestrial-sized planets suspected in the early 21st century. These were later confirmed and a sixth larger planet, probably an ice giant, suspected farthest away from the star. This is the nearest planet to Tau Ceti at a distance of only 0.1 AU (Astronomical Unit, the average distance between the Sun and the Earth). Its mass is a little more than the Earth’s and it orbits the star every 13 days. It is believed to be a rocky world with no atmosphere. Although it is massive enough to retain an atmosphere, the constant solar wind would have blasted it away billions of years ago. This planet’s orbit is twice as far from the star as Tau Ceti b at around 0.2 AU. It is a little more massive and is thought to have a thin atmosphere, mostly composed of gases from violent volcanism. This has been observed from spectrographic analysis as the planet passed in front of the star during its 35-day orbital period. The third planet from the star is still relatively close at only 0.3 AU. 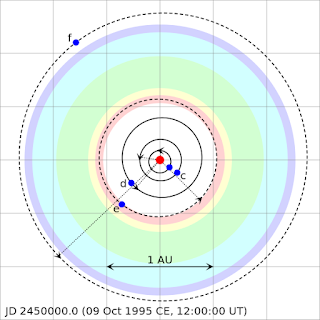 While not confirmed it is thought to be similar to Venus, but with over twice the mass at 1.9 Earth masses. It orbits the star every 94 days. 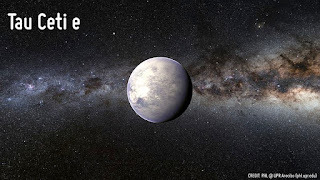 The fourth planet in the Tau Ceti system is a large terrestrial planet at almost 3 Earth masses and is half the distance from its star than the Earth is from the Sun. Little is known about whether it has an atmosphere or not and it orbits the star every 168 days. Of all the discovered planets in the Tau Ceti system, this is the one most likely to harbour life. The fifth planet in the system orbits at over 1.2 AUs from the star and is a massive terrestrial planet with almost 6 Earth masses. At this size it may actually be an ice giant or even a small gas giant. While the other planets in the system have been confirmed by observation, the sixth planet’s presence has been hypothesised from small discrepancies in the motion of the inner planets. Tau Ceti g is believed to orbit much farther out . 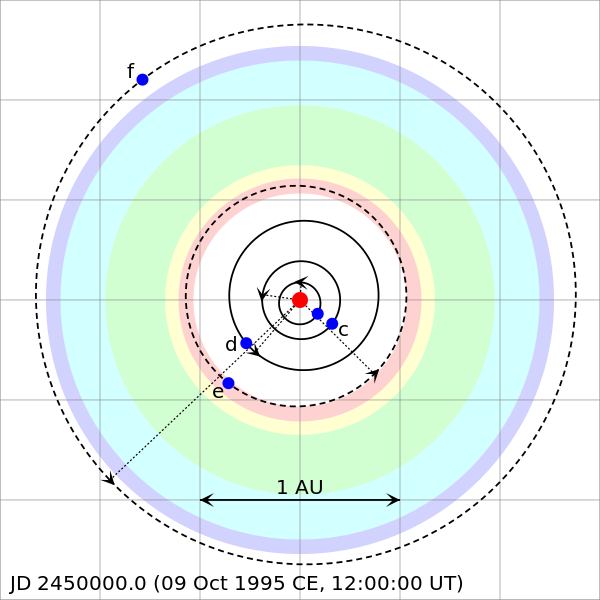 Its estimated orbital distance is between 6 and 7 AU. It is postulated to be an ice giant, or possibly a small gas giant. Tau Ceti was once considered to be a suitable candidate for life, however in 2004 a research team discovered that the system contained a dust field (also containing asteroids and comets) much larger than the Sun’s. This indicated that planets would be up to 10 times more likely to be hit by extinction-level impacts. The debris field ranges from 10 to 55 AU and poses a potential threat to the Venti probe as it enters the system.